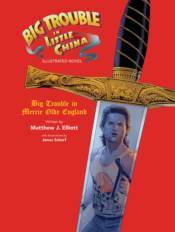 In this second Big Trouble in Little China illustrated prose novel, Jack Burton, Wang Chi, and Gracie Law are forced on an adventure to find the lost Excalibur sword, so they must traverse the mystical, topsy-turvy underbelly of England. Hunted by the Wing Kong and the reanimated corpse of Lightning, the trio discovers that things are never as they seem. Writer Matthew J. Elliott (RiffTrax, Big Trouble in Little China Illustrated Novel: Big Trouble in Mother Russia) and illustrator Jonas Scharf (War for the Planet of the Apes, Warlords of Appalachia) present a new chapter to the travails of cult hero Jack Burton!